As I’ve had 18th century riding habits on the brain for a while now, with my upcoming trip to Colonial Williamsburg (or, as I termed it to Cynthia the other day, “18th Century Disneyland!”), I thought I’d share some images and research! I do like a good image/source hunt, after all. The best source that I’ve found thus far is: Blackman, Callie. “Walking Amazons: The Development of the Riding Habit in England During the Eighteenth Century.” Costume, Vol 35, 2001. Riding habits were long worn as functional dress, but in the second half of the 18th century, they became fashionable dress as well. In addition to riding and hunting, they were worn for travelling, walking, visiting, and at home wear — in other words, informal day wear. Stylistically, they tended to follow men’s clothing, and you will see cuts/fabrics/trims that are popular in men’s clothing show up in women’s riding habits of the same era. One area that you’ll specifically see this in is the cut of the waistcoat, which has long “skirts” in the 1750s-60s, but a simple V front in the 1770s. From what I can tell from looking at LOTS of images, it appears that they could be worn over hoops from about the 1730s-50s; by the 1760s, it appears that they were generally worn over just a petticoat (or perhaps small hip pads?). Waistcoats cut to fit over hoops had a seam at the waist, and opened into an inverted V (from waist to hem), to allow for hoops. 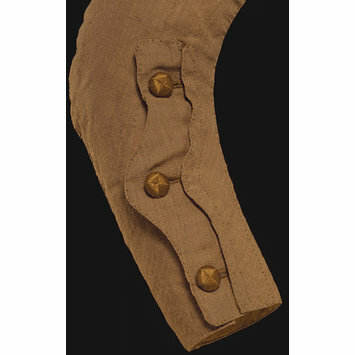 There were a variety of sleeve treatments, including cuffs, flared end, and the mariniere sleeve. Pockets could be functional or false. Early styles had simple or no collar, while later on deep revers and high collars were popular. Waistcoats could either be separate garments, or a false front sewn into the jacket. The petticoat was cut simply, with pleats concentrated at the sides (1730s-70s) or back (1780s-90s). There were a wide range of colors possible. If it was intended primarily for riding or hunting, it was often red, navy, or green. Habits meant more for fashionable wear could also be in other colors; blue, brown, beige, yellow, and even white were popular. Fabrics were usually wool or a wool/silk blend, although there is a 1780s riding habit at LACMA that is in silk faille. The wars of the 1770s made it fashionable to have a military look to one’s riding habit. Red was increasingly popular (I assume modeled on the British army uniform?). Habits were made to look like the uniforms of specific regiments. By the 1780s-90s, women increasingly wore the redingote, which was styled on the Englishman’s greatcoat, although you still see riding habits pop up. Habits were worn over “habit shirts” (see Nicole’s post for a great rundown of this style) and neckwear (cravats, stocks, or kerchiefs). Hats varied by era; tricorns were worn by English/American women only in the first half of the 18th century (but continued to be worn by Continental women — see the portrait of Marie Antoinette from 1771), followed by jockey caps in the 1760s, high crowned hats in the 1770s-80s, and tall, cyclindrical hats in the 1790s. I recommend reading Nicole and Carolyn‘s riding habit project overviews for some nice details and construction info. Today, part one of my giant vat o’ riding habit sources! Part II coming next week. Costumes at the Château pt. 2: Marie Antoinette redingote! Pink riding habit? *lust, covet, etc* Yes, please! Nice summation!!! I can’t wait to see what everyone does & how they all turn out. Great overview. I look forward to the next part! I haven’t got around making a riding habit, but more and more I get the feeling that I need one. Fabulous info, Kendra! I haven’t done much research on riding habits, so this post really sums it up well. Looking forward to part 2! But I must correct you on your acknowledgements. The blue 1750s jacket is actually from the V&A. I know, because I downloaded the image from there in one of my mad costume downloading sessions. Thanks for the link, Hana, and most esp. the correction! I’ll edit the post right now. I’ve just found this site through Hana’s link. I think it’s very interesting and I thought I’d add the link to my buttons post, but Hana already did. Thank you. By the way, I can really recommend the book I mentioned in that post: ‘Costume in detail’ especially for finding out such little things like which way the buttons close or how to arrange certain pleats. Unfortunately, as far as I remember, there is no complete 18th century riding habit in there. I am digging the trim on the Coltmans’ waistcoats! Hi Kendra! I have been reading your blog for several years now. It is my aboslute favourite, and the one that has inspired me to start my own (barockt.bloggsida.se, in Swedish so far, but that may change). I have been planning to make a riding habit from the first half of the eighteenth century for a while. Now I am planning a trip to Colonial Williamsburg this spring and thought about making it ready for that. But I am feeling a little hesistant; will it not be warm with all the wool in May? And will I not feel stupid dressed up, when the rest of my family are wearing modern clothes? At the same time I get really inspired by you post. Lots of useful information that can help get me started. What would your thoughts be? I’ve always loved riding habits, I really must make one some time. There are some really great examples here. Susanna – hmmmm! I’m not sure about Williamsburg in May! The only time I’ve been was in early May, and we got lucky and had nice weather (overcast, maybe in the 70s? a bit humid but nothing bad)… but I think it could be hot. I think I would look up avg. temps for that time. You might be better off in cotton! That being said, I would totally dress up! Who cares if your family aren’t on board, you’ll look fab and you’ll have lots of fun. I always hate going to costume-y things, not in costume, when I COULD be in costume — it’s more fun in costume, plus your costume is your calling card! What a great overview of riding habits! And thanks very much for the mention of the article in Costume, I’m going to go download it right now. I was very excited to be able to theorize that women did tailoring for other women, along with everything else they made! mmmm… Love the 18th Century ladies clothes they look Sumptious! masked Highway/Woman, ”Stand and deliver!”..
I’m doing some research on 18th century jockey caps. I wondered if you could tell me where you found that second image, the one marked 1700-50? These are great images, thanks for sharing them! Wonderful references for a post-hunt picnic diorama I am creating in roughly 1/56th scale. Thanks! Does anyone know if and where I would be able to get hold of a historic habit? I am looking for one to do side saddle concours d’elegance costume classes. Hi just wanted to thank you for creating such a great blog/website. I am a history fanatic, and the only one out of my group family u know what I mean. Since there is only so much you can see out of books, I go online to try to fill my insatiable need. You popped up under van loo. Anyway your page is informative and cool at the same time. Thank you – what a feast for the eyes! We live fairly close to Williamsburg and I’ve been there on many occasions to ramble through the village and the wonderful museum. As a rider of a certain age, still hoping to have a go at side saddle, I’m drawn to federal period clothing which looks more comfortable and has a simple elegance. Have you (or other enthusiasts) done any research into riding habits of early 19th c? Thank you. I really enjoyed reading your research and looking at the pictures. I found it very informative. I have recently started a business making bespoke riding habit/costumes for concours d elegance classes based on Victorian era and thoroughly enjoy the hard work involved. I stick to my guns that these costumes where practical and could be multi functional not these stupid skirts you see that dangle around the horses hocks when mounted that for some reason have started to appear. You can ride, run, skip, hop and jump in mine……….